I made dessert last Sunday. 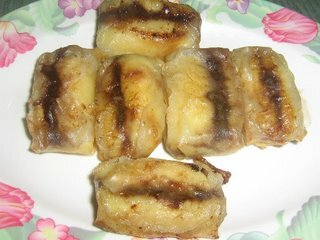 This dessert is a common street food in the Philippines and it is called Turon. This is a chocolate version of the turon. The picture attached, I know, doesnt look appetising - oily n soggy, but seriously it is heavenly. Even my angel almost wallop half of what I made. I didnt hv the big spring roll wrapper and my bananas were overripe. I will definitely try my hands at this again. I will just need to get the right size for the spring roll wrapper and bananas should be just ripe! Try making this Chocolate Turon. I am sure you'll like it! Slice bananas into half crosswise then half each piece lengthwise. Place one half of banana flat side up on a spring roll wrapper. Arrange a layer of choc chips to the surface of banana. Cover choc chips with other half and wrap as in a spring roll. Repeat for the rest of bananas. Heal oil in a pan and fry spring rolls till golden in colour. Drain oil in paper towel. Yum Yum chocolate and banana sounds heavenly must try!!! Heat oil in large pan to moderately hot. Deep fry balls untill cooked through and lighty brown.Roll in sugar to coat. My thoughts: This doughnut is quite heavy as there are no yeast just make sure u make the balls small cause it will expand. The dough will be hard to pick and roll with hands as the mixture is too soft, i add a lil bit of flour and uses two spoons and roll the dough with a lil bit of flour so i can roll it into perfect balls. Thanks for the recipe. Will try to make this one of these days and feedback. InsyaAllah! Pig Out, Chill Out & Let Out!